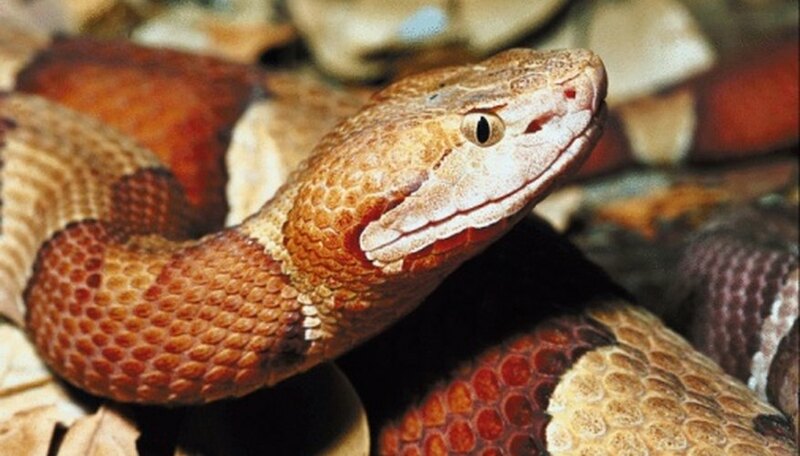 The northern copperhead is one of three venomous snakes native to upstate New York, along with the timber rattlesnake and eastern massasauga. Of the three, the copperhead is the most common, although it is still comparatively rare. Copperheads have a venomous bite, which is dangerous to humans and pets. Inhabitants of and visitors to upstate New York should be familiar with the northern copperhead. The northern copperhead is distinctive for its coppery red head and the regular bands along its body. These bands are wider along the sides of the snake than along the back. Copperheads can grow to a length of 2 to 3 feet. Copperheads are often mistaken for milk snakes, which are a nonvenomous species common to upstate New York. They can be easily distinguished by the copperhead's broad, pointed head and slit pupils. Copperheads are most commonly found in the lower Hudson Valley, and are less common in the upper reaches of the valley. They are practically unknown in the western half of the state. They prefer to live in rocky and wooded areas, where their coloration allows them to blend in with the detritus of the forest floor. They are often found in wood piles and piles of sawdust. It is not uncommon to encounter copperheads in rural areas of the lower Hudson Valley, but they tend to avoid towns and cities. The copperhead's bite is painful and should be considered dangerous. Copperheads are the most common source of venomous snake bites in the northern United States, although deaths from copperhead bites are rare. Copperheads lack the warning rattle of New York's other venomous snakes, and often strike due to being stepped on by unwary hikers. If you are bitten by a snake suspected of being a copperhead, seek immediate medical attention and do not attempt to apply tourniquets or siphon the venom; this type of first aid often causes other complications. Homeowners in the lower Hudson Valley can help reduce the likelihood of encountering a copperhead by removing potential habitats and prey. Keep rodent populations down by restricting access to bird feed or other grains. Store firewood in a box or shed rather than an exposed pile. Limit the use of wood-based mulch, because this provides an attractive hunting ground for copperheads. Keep yards free of branches, leaves and brush. Seal gaps and holes in the foundations of buildings to prevent their use as hibernation chambers for copperheads. Clay, Charles. "Copperhead Snakes in Upstate New York." Sciencing, https://sciencing.com/copperhead-snakes-upstate-new-york-8574266.html. 13 March 2018.